If you’ve been watching Knicks games lately, you’ve no doubt noticed a depressing development: Rookie Kristaps Porzingis, once the boy king of New York, has been playing very poorly. This downturn in production surely has something to do with the young player hitting a rookie wall, but it also has a lot to do with how terrible of a coach Kurt Rambis is. Rambis has said that due to Porzingis’s athleticism and versatility, he could “eventually see him at the 3-spot some,” referring to the small-forward position. That was days after Rambis said he wanted Porzingis to sprint down court after opponents’ misses more frequently in hopes of getting more post-up opportunities. Rambis, who has said Porzingis is “going to be phenomenal,” has also been critical of the rookie’s shot selection, saying “there are shots out there that he takes that I flat-out don’t like.” Porzingis’s 3-point attempts are down since Rambis’s comment. This is madness. Porzingis’s value and upside are derived almost entirely from the fact that he is a perfect stretch five. He can rebound, block shots, and drain threes at a productive clip, all of which make him the ideal center—one who can protect the paint at one end and stretch the defense at the other—for a modern NBA offense. Turning Porzingis into a small forward would wash away two of those strengths and render him nothing more than a stiff waiting around for open threes in the corner. 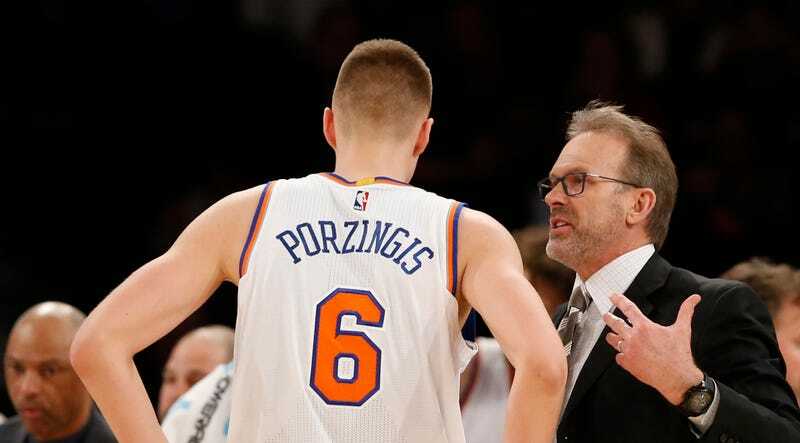 Porzingis stumbling a bit at the end of his rookie season isn’t anything to be too concerned about, but the idea of Rambis having full control over his development next season should terrify Knicks fans. This is the same guy who played Kevin Love, then in his second year, just 28 minutes a game while guiding the 2009-10 Timberwolves to a 15-67 record. One hopes that Phil Jackson will realize that a guy with a 61-155 record as a head coach and bad ideas about basketball is not the best candidate for a permanent position. If he doesn’t, next year will be a very long season for the Knicks.